360-degree swivel, retractable spout expandable up to 30 in. The pull-down, dual action spray head on the VIGO Edison Pull-Down Spray Kitchen Faucet allows for your choice of aerated flow or powerful spray for all your modern kitchen needs. The 3600 swivel spout extends up to 30 inch, and its spiral details and solid brass construction make it a highly functional and beautiful statement piece. 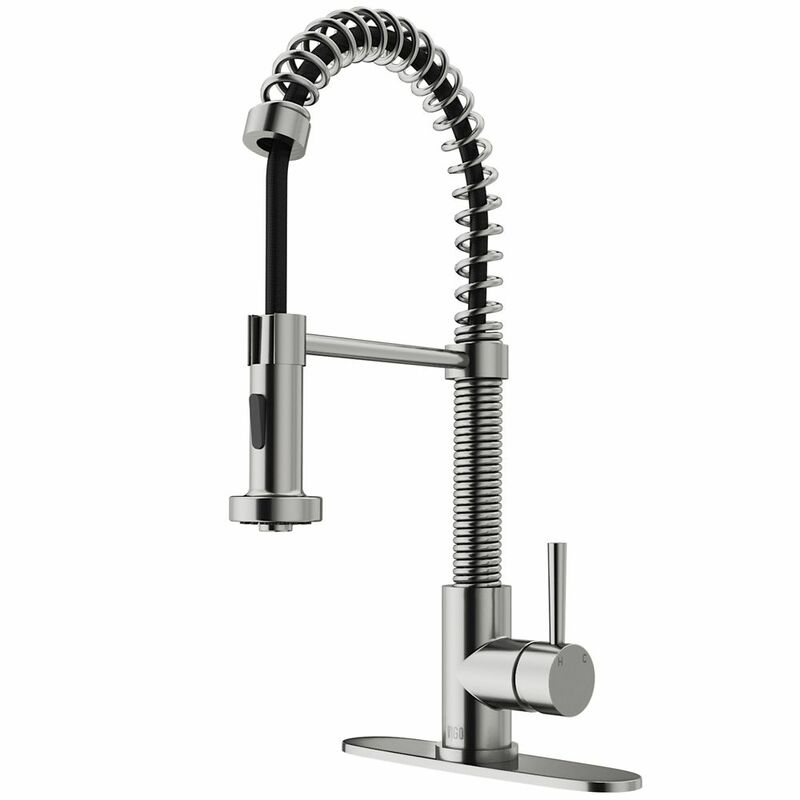 Stainless Steel Pull-Out Spray Kitchen Faucet with Deck Plate Make your kitchen "pop" with this functional Vigo faucet. Stainless steel finish with matching deck plates all solid brass construction which ensures durability and longer life. Faucet features spiral and dual functioning pull-out spray head for aerated flow or powerful spray. Includes a spray face that resists mineral buildup and is easy-to-clean. Stainless Steel Pull-Out Spray Kitchen Faucet with Deck Plate is rated 4.6 out of 5 by 1202. Rated 5 out of 5 by Adrian from Moves easily from one position to another. Switches smoothly to the spray position. Great water f... Moves easily from one position to another. Switches smoothly to the spray position. Great water flow. Color is bang on. Rated 5 out of 5 by amandamello from Might be a little too low flow for my liking, but I hardly notice because it's so beautiful! Might be a little too low flow for my liking, but I hardly notice because it's so beautiful! Rated 5 out of 5 by Brent from Works well and looks great!... Works well and looks great! Rated 5 out of 5 by Tooks from Great design Bought this about 2 months ago, and since then this faucet has worked great. And it looks good as well. Rated 5 out of 5 by Henry 123 from Very good faucet I bought his faucet and I am very happy with his purchase. Does this work for 2 inch counters?